While prequarterfinals offered some big surprises and lots of dramatic finishes, the quarterfinals were a much more predictable affair. Although two games would finish with close margins of three points or fewer, all four games featured top seeds that were largely in control for the vast majority of the games. Revolver has continued to quietly and calmly tread towards yet another finals appearance. San Francisco is the only team at this point in the tournament that truly has not been challenged by another team. This pattern did not slow against Sub Zero as captain Nick Schlag saw his team functioning at the exact level that he had been hoping for all season. Revolver took that high level of play into a 8-5 halftime lead and only extended that lead in the second half for a 14-10 win. All the while, Revolver did something that few teams at this tournament have been able to do consistently, that is to pursue contributions from all over its roster. San Franscisco’s players refuse to elevate one over the rest and there is no way standout piece. This greatly anticipated rematch of a Regional championship pitted two teams that know each other well and play a very similar, athletic style of Ultimate against each other in a fight to survive for the next round. Though Doublewide won the Regional championship title, Bravo established early in this game that this even bigger game would have a different storyline. Bravo began the game with two breaks and, though it would eventually relinquish a break back and allow Doublewide to tie the game, it never fully gave up the lead. Captain Ryan Farrell pegged Bravo as a potential semis team the first time that he saw the roster on paper, so to see his team play like as well as it did was a very satisfying experience. While on Thursday the plus matchup came from Jimmy Mickle, quarterfinals was Nick Lance’s time to shine. Lance, in his first season with Bravo, threw three 50+ yard hucks throughout the course of the game that were crucial in Bravo maintaining its lead. From Doublewide’s perspective, Bravo was making big plays but a lot of the game comes down to Austin’s own execution. Doublewide refused to go quietly though. Bravo lead 14-10 and it seemed like things were all over for Austin but Doublewide scratched and clawed to get back within one at 14-13 and even had a possession to force double-game point. For Loskorn, that said more about his team than any results could possibly bear out. Machine was fresh off of its double-game point win over PoNY heading into its matchup against Sockeye and was able to continue that high throughout the first five points of the game. The two teams traded to 5-5 before Sockeye stepped on the gas pedal and really pulled away. According to Machine, Sockeye’s many defensive looks were just too much for Machine to truly gameplan for. Slowly but surely, as Sockeye threw look after look at Chicago the game started to go south. Finally, at one point, Sockeye led 10-5 and there was not much doubt from that point on. 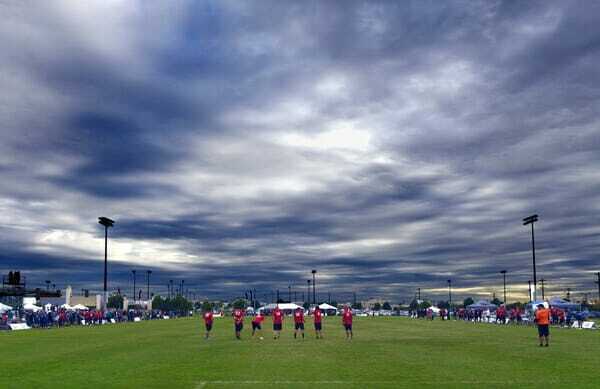 Sockeye, much like Revolver, gave itself an edge by not having to push too hard in quarterfinals. While Ironside and Johnny Bravo had to dig deep and survive scares, Sockeye was able to cruise and ride its depth for most of the second half eventually taking home a 15-9 victory. Just like all three other higher seeds headed into quarterfinals, Ironside had gone throughout the tournament relatively unchallenged score-wise. Though Boston had tight and tough games against Doublewide and Ring of Fire, at this point in the tournament, they had looked pretty comfortable. That comfort extended into this game as Ironside’s defense gave Boston a very large 13-7 lead late in the game. Leading that defensive unit all weekend has been Will Neff and Jack Hatchett. Both players who are dangerous for Boston on both sides of the disc. However, Chain would storm back into the game. On the wings of its huck game clicking and some intense defensive pressure, Chain started to chip away at Boston’s lead. According to Ironside captain George Stubbs, Ironside got inside its own head as mistakes started to pile up. Chain strung together a 5-1 run to bring the game to 14-12. Eventually, Boston was able to put Atlanta away, though, and won 15-12. For Wallack, the adversity was important for his team to experience at that point in the tournament. Comments on "Quarterfinals Recap: Men’s Division"